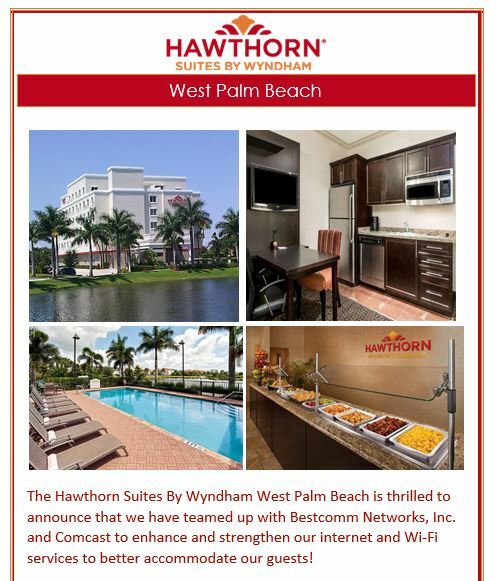 Whether you are traveling for business, leisure, and/or for an extended stay, Hawthorn Suites by Wyndham West Palm Beach will be perfect for your needs. Along streets lined with majestic palm trees, you’ll find you’re in close proximity to fantastic shopping, dining, and attractions; Hawthorn Suites is an ideal hotel with a welcoming atmosphere and a prime location. Hawthorn Suites West Palm Beach offers a vast variety of suites. Choices include king, queen, double queen, king with double queen, and suites with separate bedrooms. Fully stocked kitchenettes offer full-size refrigerators, dishwashers, and microwaves. In addition to offering luxury suites in an optimal location, Hawthorn Suites is situated perfectly within minutes of premium outlets, dining delights, sandy beaches, and historic museums. Hawthorn Suites has been awarded the 2017 TripAdvisor Certificate of Excellence. An active hotel with the Florida Department of Environmental Protection, Hawthorn Suites is committed to conservng and protecting Florida's natural resources through the Florida Green Lodging Program. Hotel Rooms are still available at the special room rate! Click the special link below. The NATS discounted rate will be automatically applied to your reservation. For an additional discounted transportation fee of $10 per room, guests can use the Hawthorn Suites By Wyndham Hotel Shuttle within the hours of 7 am – 11 pm within a five-mile radius of the hotel which includes Airport, Palm Beach Atlantic University, and CityPlace. The hotel shuttle use is based on availability, so reservations are strongly recommended. The hotel will provide shuttle passes to each guest in the room that are paying the $10 fee per room, and guests who do not wish to use the shuttle service will not be charged this fee. NATS will provide complimentary shuttle service through Molly’s Trolley from the hotel to Palm Beach Atlantic University for workshop sessions each day on a scheduled service per day.